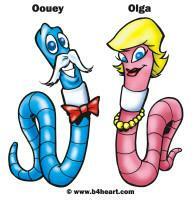 Oouey & Olga | B4HEART - Humanity Envisioned And Realized Together! New book – ‘Surprise’, reveals God’s Little Secret – If a serpent was responsible for the ‘Fall of Man’; then a worm, Oouey, could surely ‘Enlighten’ mankind. Oouey is a Simple Worm with a Simple Plan – LOVE. He wants to Save the World via B4HEART – Humanity Envisioned And Realized. Never underestimate the element of ‘Surprise’. As Legend has It, , it all started way, way back in the so-called ‘Garden of Eden,’ with Adam and Eve; whom Oouey’s Greatest Granddaddy, Ebenezer Worm (whose name implies Divine Help or Deliverance) tried but failed to warn and enlighten. For he attempted to prevent and later conquer evil as he stuck his neck out of ‘The Apple’ and shouted: “Excuse me, Madame,” just before the ‘Original Sin’ or first bite. But, Eve was so intoxicatingly engrossed, so enthused and relished in the process that she didn’t notice or see him, and she almost bit Ebenezer’s head off. In fact, Grampa Gooey was too slow, and he lost his tail in the inevitable act. Thus, ‘Curiosity’ is the ‘Original Sin’ that led to the ‘Logical Fall of Mankind’ per ‘Choice’ or ‘Free Will’. Unfortunately, since he didn’t succeed in averting the misdeed, evil manifested, and Grampa grew aghast. To make amends, he spent the rest of his life trying to get both Adam’s and Eve’s attention. But, they were too proud and salacious to listen as evil persisted and escalated. Thus, on his deathbed, in front of his entire family, he made them all promise and take a solemn vow to erase evil and pass the word on to their offspring. Hence, Oouey believes that he was deemed by fate as a duty to fulfill his Greatest Grampa’s death wish — to avenge the ‘Logical Fall of Man. “Surprise! will challenge kids to step forward and make a difference. This soon-to-be spiritual classic should not be missed. ” … Outskirts Press, Inc. In a world full of turmoil, our children are being cheated, not to mention, mentally, physically and sexually abused? Confronted with WW III, nuclear annihilation and massacres in our schools, coping is but a struggle; on a daily basis. Is it any wonder then; a state of denial? Are our children not being desensitized by violence, numbed as a way of coping by accepting violence itself as routine? What’s happening to our social and family values? What about good old fashion Fun — Nature, fishing, horsing around and worms? Did you ever see a worm after a heavy rain — crawling, helplessly lost on a long wet sidewalk; knowing, just waiting — anticipating, being baked — alive by our hot sun? Did you ever stop and help at least — one ; intervention? Try it, you might get a surprise. Maybe he’ll poop in your hand for Luck — OOPS, brew-ha-ha — Oouey Gooey!